The feel. The look. The allure. 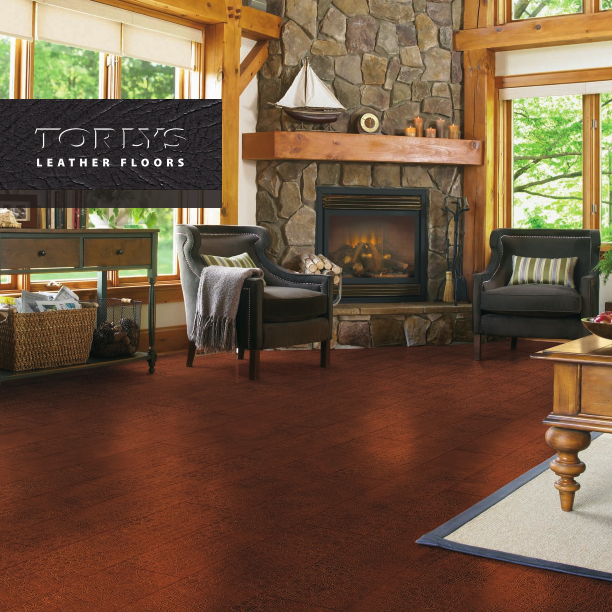 Create a truly unique and enjoyable flooring experience with TORLYS Leather. Made with 100% recycled leather, TORLYS Leather is an adventurous, sophisticated choice that will ignite the senses as well as the imagination. It’s time to express your bold sense of style. Available in luxurious planks or sophisticated tile. Being a natural product, the top layer has a 30 minute water resistance. Warm to the touch with CorkPlus™ attached cork underlay. TORLYS Leather is made from 100% recycled leather to create exceptional flooring gifted with tangible environmental benefits. The acoustics in the room in which the floor is installed and the one below has reduced noise thanks to noise-dampening CorkPlus™ attached underlay. High-density core and top layer provide “stays beautiful” assurance for years. Spills and messes are easily wiped up with a cloth. To eliminate grime and grit, clean weekly by simply using a broom or vacuum (bristles down) and then when required use our Torlys Natural Glow Eco-friendly Cleaning Kit. Refer to Torlys Maintenance Guide, for full details on caring for your floors to keep them looking like new. Where does it go? Everywhere. A statement piece for any room in the house. Depending on your lifestyle, the leather tiles and planks can be used on the floor or the walls as a statement piece. Creating mixed patterns: the length of one plank equals three tiles. The width of one plank is half that of one tile. With the attached TORLYS CorkPlus™ Underlay your feet will thank you for the added warmth and comfort while having the added bonus of noise reduction. Make a statement with the superior look of leather. Proven to exceed industry standards. TORLYS Leather is made from 100% recycled leather to create exceptional flooring gifted with tangible environmental benefits. And with TORLYS you know your floor will stand the test of time with a TORLYS 35-year residential wear warranty. We follow some of the most Indoor Air Quality stringent standards in the world. TORLYS flooring products meet California Section 01350 and/or Floor Score Certification. Confidence underfoot with TORLYS CorkPlus™ Underlay. When we tested the TORLYS CorkPlus™ attached underlay and an untreated cork underlay against bacteria, mould and mildew, the CorkPlus™ Underlay with Microban® antimicrobial protection inhibits the growth of bacteria, mould and mildew and nasty odours. Torlys leather range is manufactured using the patented Uniclic® system is the only joint backed by a gap warranty. The Look: Striking and sleek, expansive and elegant. The Feel: Finely textured leather grains, pleasing to the touch. The Details: Micro bevel-edge, four sides. Made from 100% recycled leather. Attached CorkPlus™ underlay with Microban® antimicrobial treatment.